Heat oven to 400°F. Bake rolls as directed on bag. Heat closed contact grill 5 minutes. In medium bowl, gently stir 2 tablespoons of the dressing, the turkey breast, seasoned salt and pepper. Shape mixture into 4 patties, each about 1/4 inch thick. Place patties on bottom grill surface. Close grill; cook 3 to 5 minutes or until patties are no longer pink in center. Meanwhile, in small bowl, mix coleslaw mix and remaining dressing. Top each burger with half slice cheese. Cut each roll in half. Spoon about 2 tablespoons coleslaw on bottom halves of rolls. Top with patties and top halves of rolls. 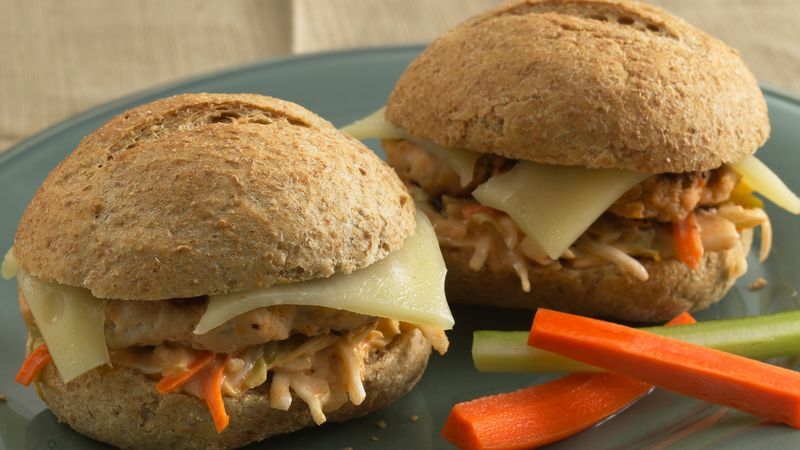 Spice it up with hot mustard and pepper Jack cheese.